In preparation for the celebration of Christ’s incarnation, Pastor Wright will preach on the four “Nativity Hymns” in the Gospel of Luke. These passages have often been set to music and have become known by Latin titles: Magnificat (Mary’s song in Luke 1.46-56), Benedictus (Zacharias’s prophecy in Luke 1.67-79), Gloria (Angels’ praise in Luke 2.14), and Nunc Dimittis (Simeon’s song in Luke 2.29-32). Join us on Sunday mornings as we worship and explore together these rich passages from God’s Word. Due to our pastor’s travel and other ministry commitments, we will not be holding Sunday evening services in the month of November. Evening services will resume at 5 PM each Sunday, beginning December 3rd. Plan to join us then for our continuing study of Ephesians. On Sunday, November 5th, we will cancel our evening service at Covenant to join with other area believers in celebrating the Reformation in song. “Let the People Sing: REF500 Hymnfest” will be held at First Baptist Church (1627 N. Highland Dr.) starting at 6 PM. It will be a service of congregational singing led by the FBC Sanctuary Choir and Union University Singers. Come, celebrate our spiritual heritage as we sing together of the great Reformation truths. Please join us as we celebrate the 500th anniversary of the Protestant Reformation! Dr. W. Andrew Hoffecker is Emeritus Professor of Church History at Reformed Theological Seminary in Jackson, MS. A graduate of Dickinson College (B.A. ), Gordon-Conwell Theological Seminary (M.Div. ), and Brown University (Ph.D.), he taught at Grove City College from 1972-1997 and then at Reformed Theological Seminary from 1997-2010. His published works include Piety and the Princeton Theologians, Building a Christian Worldview (2 vols. ), Revolutions in Worldview, and Charles Hodge: The Pride of Princeton. 12 Noon: Lunch with Missionaries for Youth/College at CPC. 6 PM: Dinner with Missionaries for Missions Committee and Session (w/spouses). Our Sunday Evening services now begin at 5:00 PM. We made this change in response to families who said the 6:00 PM time was too late for young children. 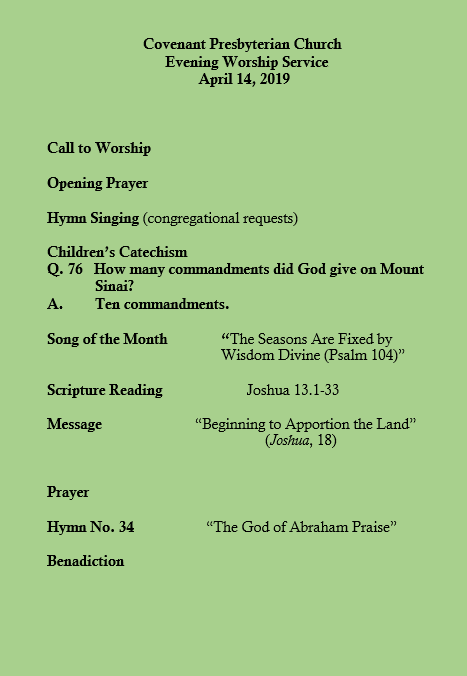 All are invited to join us Sunday evenings for worship that includes a hymn request time, a catechism lesson for children, and expository preaching (currently through Ephesians). On Sunday, June 25, we will begin a new morning sermon series through the Gospel of John. We will seek to deepen our knowledge of this book with its author’s purpose in mind: “that you may believe that Jesus is the Christ, the Son of God, and that believing you may have life in his name” (John 20:31). 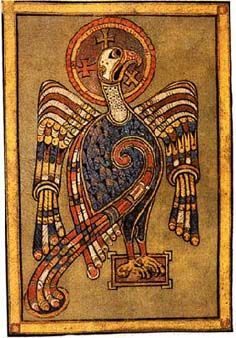 Early church fathers picked the eagle as a symbol of John’s gospel. Saint Augustine wrote, “John flies like an eagle above the clouds of human weakness and gazes most keenly and steadily with the eye of his heart at the light of unchangeable truth.” Join us as we explore John’s eagle-eye view of the life of Jesus Christ, the One in whom we may have life abundant and eternal. Welcome to the new website of Covenant Presbyterian Church. We are glad you found us, and we invite you to explore the site to learn more about CPC. You can listen to sermons, read about our worship, check out our blog, and learn about our ministries and missionaries. We hope you will enjoy getting to know us. We’d love to get to know you, and we invite you to join us any Sunday for morning or evening worship.